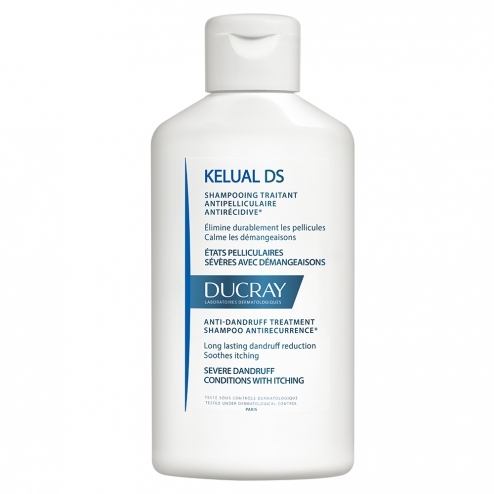 KELUAL DS shampoo is indicated in severe recurrent skin conditions associated with redness and itching of the scalp. The formula KELUAL DS shampoo contains 2 complementary anti-microbial active ingredients: ciclopiroxolamine and pyrithione zinc. Their clinical efficacy has been scientifically established on Malassezia-type yeasts, mainly involved in the occurrence of severe dandruff conditions. It also contains keluamid, keratoreductive original exfoliating active ingredient, which potentiates anti-dandruff efficacy and permanently cleanses the scalp. KELUAL DS shampoo is particularly pleasant to use thanks to its creamy texture and delicately scented. Renew, let stand 3 minutes. INCI Formula: Aqua, Sodium Laureth Sulfate, PEG-7 Glyceryl Cocoate, Dihydrogenated Tallow Phthalic Acid Amine, Polysorbate-20, Decyl Glucoside, Ciclopirox Olamine, Lauryl Betaine, Acetamide Mea, Zinc Pyrithione, Ceteareth-60 Myristyl Glycol, Perfume (Fragrance) , Magnesium Aluminum Silicate, Polyquaternium-7.